Osteoporosis is on the rise in Britain and elsewhere in the world, especially in westernised countries. While the vast majority of media on this condition tends to focus on wrist and hip fractures – or others throughout the body – osteoporosis can also have a significant effect elsewhere. It it possible that it could harm the bones in your jaw and face, leading to problems with your teeth. Those with periodontal disease may also suffer bone loss and loosening teeth. Osteoporosis is a thinning of the bones, where the bones become less dense and a person is more susceptible to bone fractures. Although it can affect all bones, it tends to affect those in the wrist, spine and hip the most. How Does it Affect My Teeth? Current research has linked osteoporosis with bone thinning in the jaw. This is the bone that plays a key role in supporting your teeth. Once your jawbone loses its denseness, you become more likely to experience tooth loss. There is a specific part of your jawbone called the alveolar process, which serves to support your teeth. It is thought that when alveolar bone loss occurs, the risk of teeth becoming loose increases. Other problems that can occur are that dentures no longer fit correctly. Some types of dental surgery or implants may not fit and function as they should when bone loss occurs in the jaw. Even though we know that periodontal disease can lead to tooth loss, there is still debate over how it relates to overall skeletal bone loss. Some studies show a clear relationship between osteoporosis and periodontal disease. It is thought that a lower bone density means that the bone is more likely to be infected with bacteria, increasing the chances a person will have periodontal disease and tooth loss. There is little you can do to prevent weakening bones directly in the face. Rather, a prevention programme will have to focus on your overall bone health. 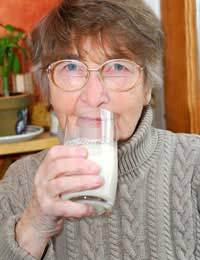 You should ensure you are obtaining adequate calcium, along with important cofactors such as vitamin D.
Women who are postmenopausal are at a greater risk due to the lack of oestrogen and its protective effect on bones. You can speak to your doctor about whether hormone replacement therapy (HRT) is right for you and whether the risks warrant you taking the treatment. Bone-building exercises are helpful for your overall body and health although won't do much directly for your facial bones. For those who have already been diagnosed with osteoporosis, there are prescription drugs on the market that can help to re-build bone throughout the body. How effective they are in terms of bone loss in the face is not yet understood. An important point to keep in mind, however, is that one group of medications for treating osteoporosis have been linked to osteonecrosis of the jaw. Osteonecrosis of the jaw is a condition where The risk is higher for those receiving the therapy intravenously, which means you will need to speak to your doctor about whether you're at risk. Poor oral hygiene is one factor that can eventually lead to periodontal disease, which can harm the bone underlying your teeth. Infections and pockets in the mouth are a breeding ground for decay and your teeth can eventually loosen and fall out. The best prevention is to ensure you brush regularly using fluoride toothpaste, floss daily and use a fluoride mouth rinse as needed. Ensuring adequate saliva is important to keep microbial activity down and enhance protection in the mouth. If you are taking any drugs that reduce saliva flow, talk to your doctor about finding a dose that might reduce this side-effect. Bone loss occurs in most people as they age but too much bone loss can lead to a diagnosis of osteoporosis. Taking care of your teeth can help prevent periodontal disease while taking care of your entire body and bone health can help reduce facial bone loss. The result is that you get a healthy body and teeth for a lifetime. Are Your Dental Treatments Really Necessary? How Safe Are Dental Sealants?